In a small study looking at pain assessments in adults with sickle cell disease, researchers at Johns Hopkins says overall, those treated long-term with opioids often fared worse in measures of pain, fatigue and curtailed daily activities than those not on long-term opioids. In a report on the new research, published online on June 15 in a special sickle cell disease supplement of the American Journal of Preventive Medicine, C. Patrick Carroll, M.D., and colleagues evaluated pain experiences of participants with sickle cell disease who were prescribed long-term opioids. Sickle cell disease is a rare blood disorder that causes excruciating pain. It is a genetic disorder, predominantly affecting African-Americans in the US, and caused by a mutation in the gene that makes hemoglobin the oxygen-carrying protein that gives the red pigment to red blood cells. In cells with the mutation, the hemoglobin forms long chains that cause the normally round and plump red blood cells to take on a sicklelike shape and clog up blood vessels. The clogged vessels can cut off oxygen to tissues and cause episodes of severe pain, known as crises. The pain from these episodes frequently drives people with the disease to emergency rooms, where they are aggressively treated for pain usually with intravenous opioid pain medications. Often, adult patients with sickle cell disease also develop chronic pain, and the way it manifests is poorly understood. Because advances in treatment of sickle cell disease have led to many more people living well into adulthood, chronic pain has been a growing problem for people with the disorder. These patients are also often treated with opioid pain medications for this chronic pain. However, there isn’t good evidence that long-term opioid therapy is effective. Animal research and some human studies suggest that opioids can paradoxically increase pain sensitivity. This concern, combined with rising awareness of the dangers of opioid therapy, particularly at high doses, has led to a re-evaluation of long-term opioid therapy for many conditions. However, those patients with sickle cell disease who have chronic pain often are prescribed high doses of opioids because the disorder is so hard to treat and recurrent crises can lead to escalating doses. For the new study, the Johns Hopkins team recruited 83 people with sickle cell disease 57 women and 26 men over the age of 18, with an average age of 39. The physicians examined patient medical records to determine who was taking long-term opioids. Twenty-nine patients were prescribed daily, long-acting opioids to manage their pain by their health care provider, and 54 patients weren’t on long-term opioids. The patients filled out daily electronic pain diaries for 90 days. Self-reported levels of pain, physical activity, fatigue and pain-related daily activity interference were recorded, along with self-reported levels of pain relief and medication satisfaction on a scale of 0 to 100. Patients with sickle cell disease and on long-term opioid treatment reported noncrisis pain intensities that were over three times higher than those not taking opioids. During crisis pain days, patients on long-term opioids also reported 32 percent higher levels of pain. Overall, patients prescribed chronic opioid therapy were more impaired, with over three times greater pain interference and twice the fatigue on noncrisis days, and 20 percent more pain interference and 33 percent higher fatigue. The investigators also performed some standard measures of pain processing on the test subjects, which measured and averaged variables such as how intensely participants experienced unpleasant heat and pressure. The investigators were particularly interested in the phenomenon of central sensitization, in which the central nervous system including the brain and spinal cord amplifies painful sensations. Central sensitization may be one way that opioids can increase pain sensitivity, and it also may play a role in how sickle cell disease causes chronic pain, says Carroll. For example, one such measure of central sensitization uses repeated pokes from a mildly painful stimulus in succession. In people who have this hypersensitization, each poke is perceived as more intense than the last because the nervous system becomes progressively more sensitive to the pain. Combining the data from several measures of central sensitization, the investigators used a scoring system that sets a normal measurement at 0 and rates how abnormal something is by how far the values move away from 0. They calculated a central sensitization index for those on long-term opioids and those not taking them. Overall patients on long-term opioid therapy showed higher levels of central sensitization, with an index of 0.34, than those who were not, with an index of -0.10, as Carroll expected. In participants who were not on chronic opioid therapy, the level of central sensitization correlated with the level of noncrisis pain. However, in patients who were taking chronic opioid therapy and also had higher levels of central sensitization and clinical pain, the correlation essentially vanished. Carroll says this was surprising and suggests that the mechanisms of pain in sickle cell disease patients on long-term opioid therapy may be different in an unexpected way from that in patients who don’t take daily opioids for pain. Carroll cautions that their work is preliminary and should not lead physicians or people with sickle cell disease to take away opioids that many need to control unbearable pain. One of the biggest challenges in sickle cells disease is that clinicians may not believe patients are in pain when there aren’t any signs of tissue damage or believe they are drug-seeking, and thus contribute to suffering. 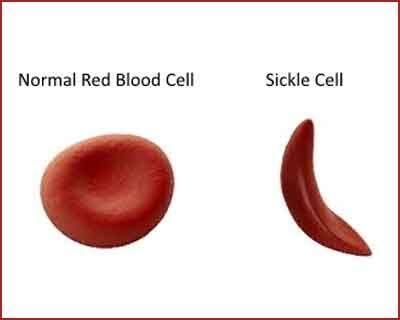 According to the Centers for Disease Control and Prevention, sickle cell disease affects millions of people worldwide and around 100,000 people in America. The frequency of hospitalizations for pain treatment makes sickle cell disease one of the most expensive conditions to treat in the American medical system. The disease originated in Africa, India and the Middle East tropical countries where malaria is prevalent. Those who carry only one gene for the disorder known as the sickle cell trait have some protection from malaria, whereas those who inherit two copies develop the classic and most severe form of sickle cell disease.